Termites are very detrimental to homes and businesses, especially in the real estate industry and cause millions of dollars of damage every year. If you see one, you have many! We’re happy to conduct an inspection, especially if you’re buying or selling your home. You should know that ANY structure can become infested with Termites; even homes with poured concrete walls. Because termites can set up shop anywhere, you’ll want to know what to look for Termites can be noted by seeing something like “bubbling” in the wood, or what appears to be imbedded mud, in the wood. A Termite Shelter Tube is the easiest way to look for the location of the pests; it is a tube made of mud that is constructed onto the wood by worker termites. The tube can be just a trace of an inch in width to sometimes 2” wide. It can be located running up foundation walls, on sill plates or on joists. Once Termite Tubes are located, the wood should be probed with a knife or screwdriver to determine the extent of damage. Just in the US, Termites cause MILLIONS of dollars of damage each year. To save yourself from potentially being one of those damage victims, your home should be inspected annually. But I don’t see any Termites swarming? Termites can be in a home for as long as seven years until the actual colony is strong enough to swarm. Swarmer Termites are the breeders. They swarm in the springtime between March 15th and May 15th. After swarming, the males mate with the females and a few of those mated females start new colonies. Swarmer Termites are only an indicator that you have an actual colony in or near your home. 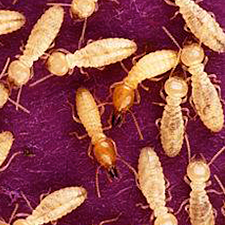 The WORKER Termites are the ones that do the damage. Termites can be found almost anywhere. They prefer sandstone or limestone soils and are rarely found in shale or slate soils. Termites need high-moisture content in the soil. 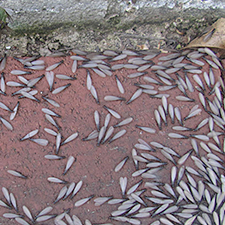 Many times, infestations can be found in basements near an exterior dripping hose bib, leaking downspouts or simply where water is leaking through the foundation walls. The drier your internal environment is, the better off you are. 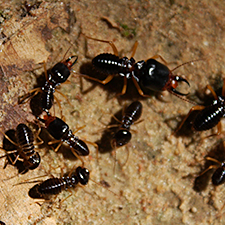 Don’t worry: Termites do not bite, sting or chew….they just simply eat wood. Lots of it!